Boxing gloves: Essential for working on strikes, such as jabs, hooks, and uppercuts. Handwraps: Good for protecting your hands when training or fighting competitively. Headgear: Used for sparring to protect the skull from harsh blows. Cup: Essential for male MMA fighters. Mouthpiece: Critical for protecting your teeth while competing and training. Try conditioning while wearing a mouthpiece to get used to wearing one. MMA gloves: Necessary for competitions. You should wear MMA gloves during sparring and grappling sessions as well so you can get accustomed to them. MMA shin guards: Helpful for protecting your shins when training or sparring. Stability ball: A great tool for working on your balance and control. Jump rope: Useful for warming up before training and a common tool for MMA practitioners. Thai pads and focus mitts: Good for using with a partner when you want to work on knees, kicks, and other strikes. Kettlebells: A cast iron weight with a handle; a favorite tool among MMA fighters for full-body conditioning. 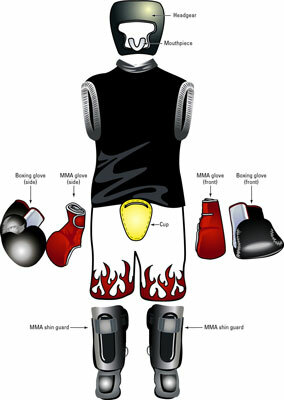 MMA attire: Can be worn inside and outside of the ring and includes T-shirts, hoodies, sweats, and shorts. MMA clothing tells people that you’re living the MMA lifestyle. It’s a conversation starter, and it may just stop someone from trying to push you around and steal your milk money. Most gyms specializing in MMA will have a lot of this equipment. As for schools, they usually suggest that you buy your own handwraps, mouthpiece, cup, and gloves. Look to see whether a school you’re interested in has some of the listed equipment available. A good school or gym has plenty of MMA gear and safety equipment (think mats and first aid kits).